Report: Hawks To Host Outdoor Game At Notre Dame? The Chicago Tribune is reporting on Tuesday that the National Hockey League has talked to Notre Dame about hosting an outdoor game featuring the Chicago Blackhawks. This makes sense on a number of levels, including the NHL trying to engage audiences in new, non-traditional venues. Blackhawks Senior Vice President and General Manager Stan Bowman graduated from Notre Dame in 1995 and has taken the Stanley Cup back to South Bend after the Hawks championships. Chicago has also hosted training camp at Notre Dame over the past few seasons. The Blackhawks have also maintained a development relationship with Notre Dame over the past few years as Chicago has had prospects playing for the Fighting Irish. 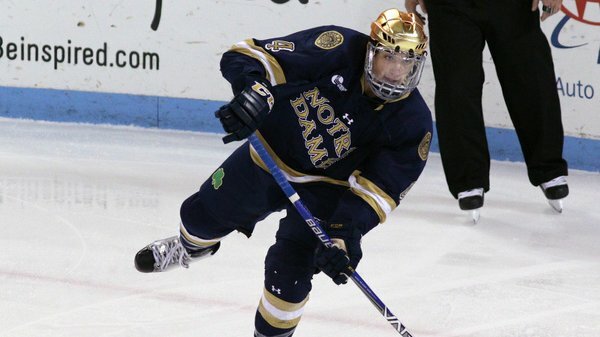 Defenseman Stephen Johns (now with Dallas) and forward Vinnie Hinostroza have signed with the Hawks after being drafted, and the Irish currently feature defenseman Dennis Gilbert. Notre Dame was the host university of the 2017 NCAA Frozen Four, which was held at the United Center.